Scott Cater was introduced to lacrosse while attending the University of Minnesota-Duluth in the early 1990s. Cater's friends thought his background as a high school hockey goalie made him the perfect person to man the net for the school's lacrosse team, and he decided to give it a try. His first time playing between the pipes came during a practice, and after stopping several shots from one of the team's best players, he was hooked. "Being able to try a sport for the first time and have some success created a huge spark for me," he said. "I’ve loved the game since that first practice." More than two decades later, Cater's passion for lacrosse remains strong, and over the years, he's done his part to help grow the game in Minnesota. 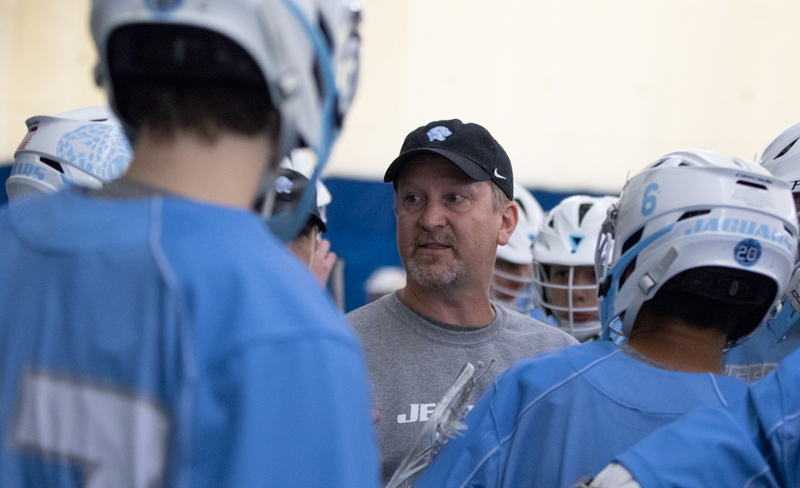 Cater has coached boys' high school lacrosse for 22 years and has seen the sport transition from the club level to a Minnesota State High School League sanctioned activity. Cater started his coaching career at Breck in 1997, and a year later, became head coach at Bloomington Jefferson, where he helped guide the Jaguars to Minnesota Boys' Scholastic Lacrosse Association state champions in 2000 and 2003, and to a state runner-up finish in the 2015 Minnesota State High School League tournament. MN Lax Hub: Some people open a bottle of champagne while others go out for a nice dinner to recognize accomplishments. What did you do to celebrate after achieving the mark? SC: Immediately after the game, parents presented me a banner. Then the entire coaching staff and three-fourths of the guys from the 15-year anniversary [team] ran out onto the field. We had a toast (later on). MN Lax Hub: You’re a former hockey player turned lacrosse coach. How do you balance coaching so many different skill sets and backgrounds with the learning curve of lacrosse? SC: That raises the question: Is it the athlete that makes the athlete, or the lacrosse skills that make the athlete? Some kids may come in super athletic and have a role on a team as they develop and find a (starting) spot on the field their junior/senior year. Some kids are really good at lacrosse skills and movements and they continue to excel. It’s fun to work with both types of kids as they’re coming in. MN Lax Hub: Have you had to alter coaching style or communication style in the last two decades due to changes in players’ attitudes/personalities? SC: Year to year you get different groups of kids. We’re in a people business, so you get all types of behavior, effort and focus. With those factors, you have to find what works for the betterment of the team and have kids understand they are a piece and have a role. When you can champion that role, that’s when you can make a difference for 28 high school boys. MN Lax Hub: How has your approach to coaching changed over the years? SC: We really talk a lot about positive coaching and really trying to build kids up as often as possible. So when they face adversity, they have the mental toughness to get through it. If you’ve built those soft skills behind the scenes, the kids will get there and they’ll climb the mountain for you and start to win those games. MN Lax Hub: On the night you recorded your 200th victory, Jefferson's 2003 state championship team was in the stands for its 15-year reunion. How was it reaching the momentous mark in front of that group? SC: We had been planning this 15-year reunion for the 2003 team since January and, lo and behold, it falls on the same night I earn the 200th victory. We presented them with their jerseys — I hung onto [the jerseys] in case we did something like this. Jefferson lacrosse has a rich tradition and our former players come back and talk to our kids — we like to keep that history alive. If you presented me a purple pack of Wild Berry Skittles, I know I’m having a great day. That’s my favorite candy to eat. MN Lax Hub: Players listen to music or meditate before games to prepare to play. What do you do as a coach to get ready for a game? SC: Normally, I'll get a full burrito from Chipotle near the school. But on game days, it's two hardshell tacos with the sour cream on the side. I don’t want to spend any more time [on dinner than] it takes to eat. I’m walking through the scenarios that play out for the game, and I want to make sure I’m ready. MN Lax Hub: How were you tracking the victories to know you were getting close to No. 200? SC: I teach [mathematics] at Jefferson and started decorating my room a few years ago because kids were asking how long I coached and if our teams were any good. I got those questions from Jefferson students on a regular basis, so I started hanging up signs, screwed trophies to the wall and have pictures of different teams and every single game score and record from every season ever. Kids take some interest in it — they like the history — the banners in the classroom creates a Jaguar feel to it. MN Lax Hub: Coaches use all sorts of ploys to motivate players. You may see a basketball coach get a technical foul to send a message. What’s your go-to ploy? And what’s one ploy you used that surprised you either by working or not working? SC: Definitely not yelling at the refs or trying to get a bench penalty — those days are gone. I’ll turn [to] the bench and ask them for [energy], turn and face our team and remind them of a previous successful play. I nudge our other coaches on the sideline to get their positional players fired up, too. When I read those situations, I try to elbow them. Sometimes it's fun to dare your wing players to win a ground ball on a faceoff, and when they do, the long-stick midfielder or defensive midfielders get off [the field] and high five. When they do (win a ground ball), it’s such a fun little high five. I like that one.